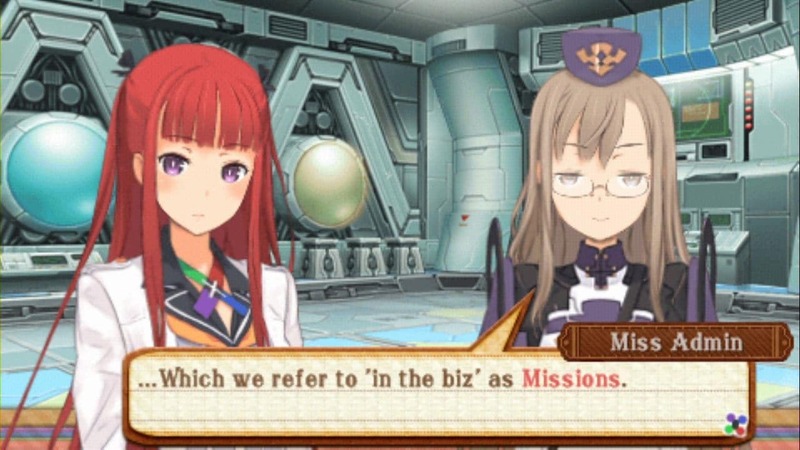 Banpresto and Strategy RPGs go hand in hand, so one would think that Summon Night 5 would be a no brainier for Bandai Namco Games to localize. Especially as it doesn’t suffer from the licensing issues that Banpresto’s flagship SRPG series Super Robot Wars does. For some reason Bandai Namco chose to skip over this 2013 PSP release. Thus Gaijinworks has taken it upon themselves to localize and release it in 2015. So why would Bandai Namco choose not release this one? Also, can a 2013 game meant for last gen hardware compete with current day SRPGs on the Vita and 3DS? Let’s take a look and find out. First though, a bit of history regarding the Summon Night franchise itself. Developers of Super Robot Wars, the Compati Hero series, Another Century’s Episode (with FromSoftware), Ar Tonelico (with Gust) and the publishers of Summon Night. These guys are made of awesome. Summon Night began in 2000 with the first game’s release for the PlayStation in Japan. 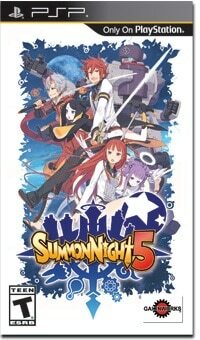 Developed by Flight-Plan (Eternal Poison and Black/Matrix) the franchise currently has 5 games in its main series, Summon Night 5 being the first of these to be released in the West. These are all Strategy RPGs. There are also seven spin off games, three of which have been released in West thanks to Atlus. 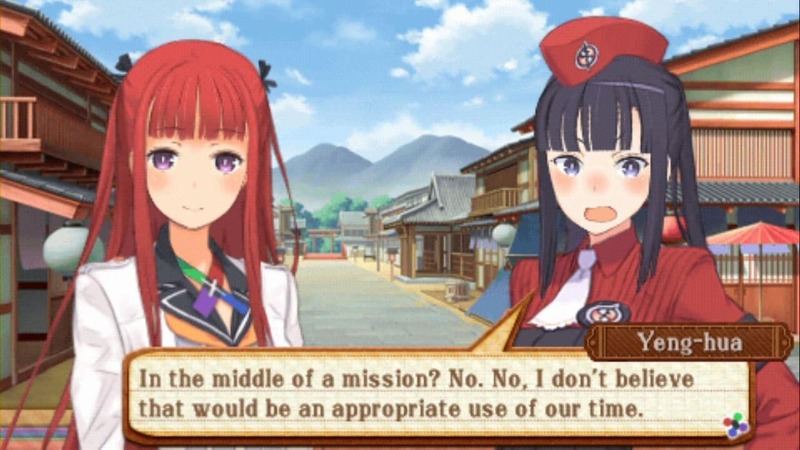 These are Summon Night: Twin Age¸ which plays similar to Ys, Summon Night: Swordcraft Story and Summon Night: Swordcraft Story 2¸ which plays more like a Tales game. Sadly, the franchise died when Flight-Plan closed its doors in 2010. It wouldn’t be until 2012 when the series would be given a second chance. Enter Felistella! Yes, the same Felistella who would later go on to develop the Hyperdimension Neptunia Re;Birth games and Luminous Arc Infinity. Namco Bandai (who now owned Banpresto and thus Summon Night) released the first two games as PSN classics and had Felistella create enhanced remakes of Summon Night 3 and Summon Night 4. With those done, work on Summon Night 5 concluded and Felistella would go on to do other projects, before coming back for Summon Night 6, which will be released in Japan later this year. Namco Bandai Games chose not to bring Summon Night 5 to the West. Instead Gaijinworks took it upon themselves to localize the game and do a limited pre-order physical release, with the game being generally available via the PlayStation Store. So now that you know what Summon Night is, let’s delve into the game with the graphics. Keep in mind this is a PSP game. It looks a little rough, but there’s a lot going on under the hood. Graphically speaking Summon Night 5 appears about average for a PSP game. Playing this on the PlayStation TV, I really could notice the graininess of the resolution and textures. That’s not to say the game is bad graphically. Felistella did do quite a lot with them for this one. Each of playable characters have 3D models that are used on the map, during attack cut-ins, and even on the status screens. Everyone feels well animated, and fluid for a PSP game. The biggest accomplishment though are the character models during the conversation portions of the game. Everyone is extremely expressive and animated. It’s honestly the best part of the game. It’s a shame that it also turns into the biggest thing Gaijinworks got wrong during the localization process in regards to sound. As expressive as these characters are the fact we have no voices really takes away from the experience. Seriously, there was no room in the budget for vocals at all? Let’s get the big one out of way in the sound department. Gaijinworks chose not to include the Japanese voice track for the conversation portions. While we do have voice clips that play during the attack animations and end of battle screen, the story sections do not contain any voice acting. Which is a crime in my book, considering how gorgeous these characters look during these sections. Even if I didn’t tell you there were voices in the Japanese version, you’d probably figure out something feels like it’s missing here. I realize that sometimes you have to cut costs, but this was a mistake. The opening fares a little better in that there was an English cover done instead of just having an instrumental track. It’s not a major deal in the grand scheme of things, but it may be of concern to some of you. I’ve included a link to cover below so you can decide for yourself. As for the soundtrack overall, it’s not bad. It’s actually pretty varied and nothing grated on my nerves. Which is saying something due how many times you’re going to be hearing certain stage themes. Why? Because this game takes grinding to a whole new level. 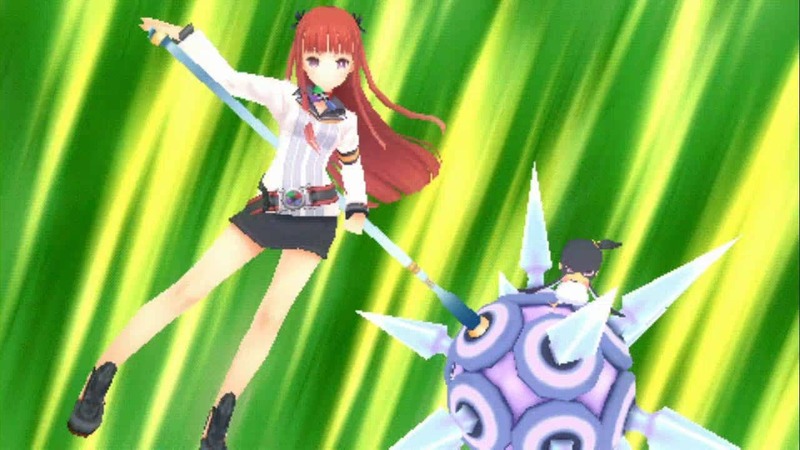 Summon Night 5’s game design is more than a little unbalanced. Like with most SRPGs, you’ll deploy a certain number of units in order to face an enemy force. In this case never more than 5. You’ll either clear the field or complete a specific objective. From this you’ll of course get experience points. Unlike most RPGs though, you don’t automatically level up. The reason for this is that you need to choose what to spend your experience points on, either leveling up or purchasing skills. Skills can be things like special attacks, defensive postures that allow you to negate damage or counterattack, or even passive buffs. 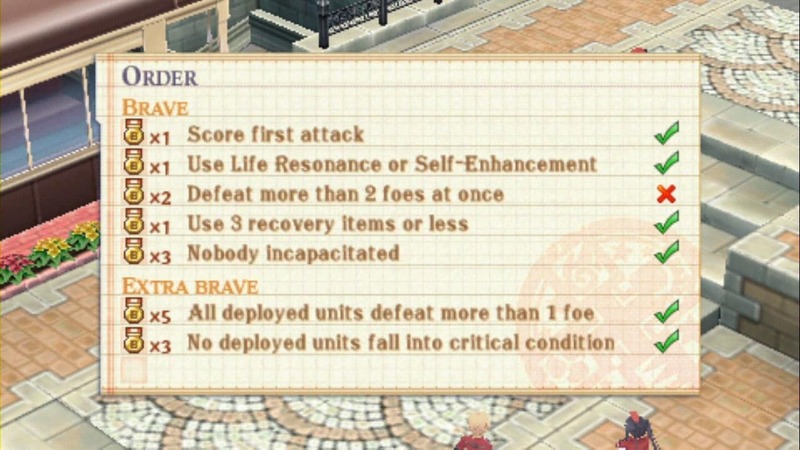 Also, you can level these skills up, which of course costs more EXP. Therein lies my biggest issue with Summon Night 5. Due to needing experience points for so many things, you need to replay stages repeatedly in order to gain more experience. Except the game reduces the amount of experience points gained from an Event Battle to 1/2 of their original value during repeated attempts. Missions Battles can also be done to acquire new skills and more EXP (with no reduction for redoing them) but the gains never quite feel like they’re enough. To make matters worse, if you just throw a bunch of under leveled units at map and hope that your onslaught of troops will overwhelm the enemy, then you’ve got a nasty surprise in store as this game punishes you for such reckless behavior through the use of Brave Points. You start every mission with 50 Brave Points and this can go up to 200. There’s a lot you can do with Brave Points, but the key thing to remember is that if you ever run out of BP then you instantly game over. While this never happened to me, I came really close on a few occasions to almost depleting my BP. The reason is that you lose one BP for killing a unit that’s a lower level than you, and 20 BP for having one of your units defeated. Want to switch in another unit? That’s going to cost you 10 BP. The way you can generate more BP is by killing higher level units, or by completing orders during Event battles. Orders are just as they sound, objectives to complete during a battle that if met award BP and medals. The medals can be used to buy special party skills or can be turned in at the shop for special items. If this sounds rather complex, it’s because it really is. There’s a ton a depth to this battle system and the walls of tutorial pages it throws at you is more than a little intimidating, but after playing around with it for a few hours I started to get a feel for how things worked. Which brings me to one of the very good points about this game. You can play it in whatever style you want. The Orders Screen. Try to complete as many of these as you can in order to keep your BP up. While the game really tries to push you towards focusing on magic attacks via summoning, you’re not required at all to stick to that style of play. Characters all have different classes you can unlock that have different base stats. In addition, when leveling up you can assign three bonus points per level. While the game limits how many points you can assign to one stat per level, it’s not impossible to spec your character anyway you want. I decided to go for a team of physical attackers, and I was able to clear the game without any major issues aside from just grinding to level up the right skills. In fact, characters with the preempt skill will attack before the enemy does rending them almost invincible if they can one-hit KO an enemy. This won’t work against some attacks however, so some planning is still required. Before we move onto the story I want to touch upon one thing really quick and that’s bugs.